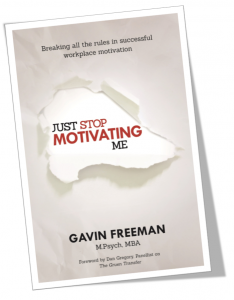 Just Stop Motivating Me is a new way of looking at why we act the way we do, how we can create smarter work environments and what is needed for individual to change the way they work. Introducing the concepts of “motivation to succeed” and “motivation to avoid failure” as part of a wider motivational continuum, this presentation delves into the human psyche, which determines our ability to maintain or change how we approach work. We are constantly exploring the difference between good and great and this presentation takes the question to next level and explains the psychological angle. Good chance it is not what you are thinking it is! With testimonials and interviews with CEOs, senior executives and coaches, Just Stop Motivating Me is bound to leave you feeling motivated and ready to take on the world. I have included a questionnaire, designed to help you understand your own motivational mindset. 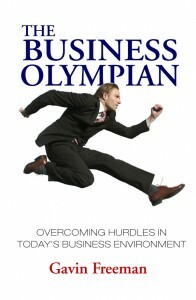 If you are interested in taking the test click on the book image. On completion your score and additional information will be available for download. The questionnaire should only take about 10-15 minutes to complete. I highly recommend you don’t spend too much time thinking about your answer and simply answer with the first thought that comes to mind. Once you have completed it, you will receive two scores; a Motivation to succeed score and a Motivation to Avoid Failure score. These score will be emailed to you along with a document explaining the results and some ideas on how to improve your motivational mindset.